Dr. Tate is Postdoctoral Fellow in Geriatric Psychiatry, University of Pittsburgh, Department of Psychiatry, CRISMA Center, Department of Critical Care Medicine; Dr. Sereika is Professor and Director, Center for Research and Evaluation, Ms. Divirgilio is Project Director, Dr. Nilsen is Postdoctoral Fellow, University of Pittsburgh, School of Nursing; Dr. Demerci is Postdoctoral Fellow, University of Pittsburgh School of Medicine, General Academic Pediatrics; Dr. Campbell is Predoctoral Fellow, University of Pittsburgh, School of Nursing, Pittsburgh, Pennsylvania; and Dr. Happ is Distinguished Professor and Director, Center of Excellence in Critical and Complex Care, The Ohio State University College of Nursing, Columbus, Ohio. This study was funded by the National Institute of Nursing Research (K24-NR010244) and the National Institute of Child Health and Human Development (5R01-HD 043988) (principal investigator [PI], M.B.H. ; J.D. ); National Institute of Mental Health, T-32 (MH19986) (PI, Reynolds; J.A.T. ); John A. Hartford Foundation Building Academic Geriatric Nursing Capacity Pre-Doctoral Scholarship (M.N., G.C. ); and the National Institute of Nursing Research (F31 NR012856, M.N. ; and F31 NR011561, G.C.). Dr. Sereika and Ms. Divirgilio have disclosed no potential conflicts of interest, financial or otherwise. Address correspondence to Judith A. Tate, PhD, RN, Postdoctoral Fellow, Geriatric Psychiatry, University of Pittsburgh, Department of Psychiatry, CRISMA Center, Department of Critical Care Medicine, 600 Scaife Hall, 3550 Terrace St., Pittsburgh, PA 15238; e-mail: jta100@pitt.edu. Accurate symptom identification during critical illness is affected by patient communication difficulties in the intensive care unit (ICU) (Puntillo, Smith, Arai, & Stotts, 2008). Symptom management, an essential component of quality patient care, begins with the assessment and identification of symptoms from the patient’s perspective. Problems in symptom communication arise from structural obstacles to speech-related obstacles to endotracheal intubation and mechanical ventilation. In addition, communication difficulties can develop as a result of cognitive changes that affect perception, attention, or level of consciousness, which are all hallmark characteristics of delirium. Delirium, a condition that frequently accompanies episodes of critical illness (McNicoll et al., 2003; Ouimet, Kavanagh, Gottfried, & Skrobik, 2007), represents a significant public health problem with profound impact on patient outcomes such as mortality (Ely et al., 2004; Lin et al., 2004; Pisani et al., 2009; Shehabi et al., 2010), length of hospital stay (Ely, Gautam, et al., 2001; Thomason et al., 2005), duration of mechanical ventilation (Lat et al., 2009), and increased hospital costs (Ely, Gautam, et al., 2001; Milbrandt et al., 2004). Generally, delirium is reversible; however, persistent long-term cognitive dysfunction is associated with delirium in critical illness (Fong et al., 2009; Girard et al., 2010; Hopkins & Jackson, 2006; Hopkins et al., 1999; Jackson et al., 2003; Morandi et al., 2012; Saczynski et al., 2012). Older adults are at greater risk for developing delirium during acute and critical illness (Peterson et al., 2006; Pisani, Murphy, Van Ness, Araujo, & Inouye, 2007). Delirium experienced by older adults is associated with increased mortality (McAvay et al., 2006), postsurgical complications (Balas, Happ, Yang, Chelluri, & Richmond, 2009), increased duration of mechanical ventilation and hospital length of stay (Freeman et al., 2009), increased care requirements at discharge (Balas et al., 2009; Freeman et al., 2009; McAvay et al., 2006; Rudolph et al., 2011), and decline in postdischarge physical function (Balas et al., 2009). Delirium is distinguished by symptoms of inattention with acute onset, fluctuating severity, and changes in level of consciousness (Ely, Inouye, et al., 2001; Ely, Margolin, et al., 2001). Delirium can be further examined by motoric subtype (Peterson et al., 2006). Delirium presentation with increased motor movement is classified as hyperactive and delirium presentation with decreased motor movement is classified as hypoactive. Hypoactive delirium is most often misidentified because patients are quiet and less responsive (Meagher, O’Hanlon, O’Mahony, Casey, & Trzepacz, 2000; Pandharipande et al., 2007). When examined longitudinally, critically ill patients most often experience a mixed type of delirium (Peterson et al., 2006), although older adults tend to experience hypoactive delirium (Peterson et al., 2006). Delirium may further compromise patients’ ability to communicate their symptoms or symptom distress. The effect of age and delirium on patients’ ability to communicate their symptom experience has not been studied. Furthermore, the impact of delirium on day-today care in the ICU is unknown. This secondary analysis of data from the Study of Patient–Nurse Effectiveness with Assisted Communication Strategies (SPEACS) clinical trial study data provided an opportunity to explore the role age and delirium have on symptom communication between intubated ICU patients and their nurses over a 2-day period. What is the prevalence of delirium and delirium subtypes in a sample of intubated ICU patients across five time points? How does older age impact delirium occurrence and/or presentation in this sample over time? Is there a difference in symptom identification and initiation of symptom discussion by patients in delirious states than when patients are not delirious? Is there a difference in frequency of symptoms identified and rate of initiation of symptom discussion between patients who are younger than 60 and those 60 and older? We conducted a secondary analysis of data from a quasi-experimental sequential cohort clinical trial (Happ, Sereika, Garrett, & Tate, 2008). The SPEACS trial measured the effect of a multi-level intervention (nurse education, communication materials, and specialist support) to improve communication performance between critical care nurses and non-vocal ICU patients. SPEACS study design and preliminary results are detailed elsewhere (Happ et al., 2011; Happ et al., 2008; Nilsen, Sereika, & Happ, 2013; Radtke, Tate, & Happ, 2012). The SPEACS trial and this secondary analysis were approved by the local Institutional Review Board. We recruited 89 intubated critically ill adults from a 32-bed medical ICU and a 22-bed cardiovascular ICU. Patients with a history of cognitive, speech, hearing, or language impairment were excluded. Participants were 21 or older, able to understand English, scored > 13 on the Glasgow Coma Scale (GCS; Teasdale & Gentleman, 1982), nonspeaking due to endotracheal intubation, and likely to remain intubated for at least 48 hours. Informed consent was obtained from participants or their proxy. After enrollment, patient participants were assigned to be cared for by an enrolled study nurse for 2 consecutive days. Nurse participants were employed with permanent assignment to one of the study ICUs, had at least 1 year critical care experience, and regularly worked 2 consecutive day shifts. Nurses were excluded from study participation if they had a diagnosed hearing or language problem. All nurses provided informed consent. Because the focus of this study was on patients, all references to “participants” relate to patient participants. All demographic data (e.g., age, gender, race/ethnicity) were collected from the electronic medical record (EMR) and entered on TELEform™ (version 10) that were optically scanned into an Oracle® (version 10g) database. Trained coders reviewed each videorecording to determine symptom communication. To best quantify the participant’s symptom communication, full videorecorded sessions (mean = 10 minutes; range = 3 to 30 minutes) were analyzed, assuming that nurses had relatively equal opportunities to elicit symptoms from participants across all time points. Nurses’ notes in the EMR were reviewed for additional information about the participant’s symptom communication. Data were collected via the investigator-developed ICU Symptom Management Record (SMR), which is a modification of chart abstraction tools originally developed and tested for pain assessment and treatment with critically ill intubated participants (Gélinas, Fortier, Viens, Fillion, & Puntillo, 2004). This modification expanded the tool to address other major symptoms experienced by intubated participants in the ICU and delineated participant self-report from nurse assessment and interpretation. The SMR includes the checklist of 15 symptoms from the Condensed Memorial Symptom Assessment Scale, which coders evaluated as present or absent in the videorecorded dialogue between nurse and participant and in the EMR nursing documentation. To achieve consistency among raters, definitions were developed for each symptom from an extensive review of the literature. Definitions were refined during expert review and pilot testing. Additional symptoms (e.g., hot/cold, discomfort, frustration, confusion, scared) and an “other” category were added after preliminary use and pilot testing. The final SMR checklist contained 21 symptom categories and their descriptions. For the purposes of this study, when a symptom was identified as “present,” its identification was further explained by description of how the symptom was reported and by whom: (a) participant self-report in videorecording (e.g., participant nods affirmatively when nurse asks if he or she is having pain); (b) participant self-report documented in the EMR (e.g., nursing notes read “patient complained of/nods ‘yes’ to dyspnea”); and (c) who (nurse or participant) initiated the symptom discussion. Medical record abstraction was conducted to determine nurses’ documentation of patient reports of symptom communication. Nurses noted participant communication about a symptom using phrases such as “patient states…,” “patient complains of…,” and “patient treated for complaint of…” Nurse descriptions of treatments without a symptom label or phrases that were equivocal such as “patient appears…” or “patient has…” were excluded. Instances of participant-initiated discussions or requests about symptoms were documented from videorecorded evidence if participants summoned the nurse and communicated a symptom successfully to the nurse. Participant-initiated discussions are important indicators of a higher level of participant communication ability and independence (Light, Dattilo, English, Gutierrez, & Hartz, 1992). Presence or absence of participant self-report of symptoms from either the videorecorded sessions or from the nurses’ notes were recorded onto a TELEform and optically scanned into the database. Raters achieved > 80% agreement on the presence/absence of symptoms and treatment. Kappa values for symptom identification ranged from 0.504 to 1.00 (i.e., moderate to perfect agreement) (Landis & Koch, 1977). Several symptoms (nausea, worry, shortness of breath not during weaning, difficulty sleeping, confusion, discomfort) were not able to be evaluated due to low occurrence/low variability in the interrater reliability sample. Most (n = 8 symptoms) had kappa values > 0.74, indicating substantial agreement (Banerjee, Capozzoli, McSweeney, & Sinha, 1999; Landis & Koch, 1977). All analyses were conducted using SAS version 9.2 and Microsoft® Excel 2007. The level of significance was set at 0.05 for two-sided hypothesis testing. Age was dichotomized into two categories (younger than 60 and 60 and older). Participant self-reported symptoms were dichotomized (present or absent from either videorecording or EMR source). Descriptive statistics (frequencies and percentages) were computed to summarize categorical variables (e.g., gender, age, CAM-ICU, delirium motoric subtypes, symptoms, and participant initiation of symptom communication). Categories of delirium trajectories were defined as present for all five time points (enrollment and four study sessions), absent for all five time points, and mixed or having at least one measurement where delirium was present and one where delirium was absent. Descriptive statistics (means, standard deviations, and range) were computed for age as a continuous variable for description of the sample only. We used marginal modeling with generalized estimating equations and Wald statistics to assess the relationship of delirium presence with participant self-report of symptoms communicated and participant initiation of symptom discussion. We assumed a binomial response using cumulative logits, respectively. This approach was appropriate because of the repeated nature of the data and the likelihood that symptoms or self-report might be correlated between individual participant sessions. We analyzed the effect of delirium and age category univariately and as a contrasted model. Average patient participant age was 56.81 (range = 24 to 87), and 40 (45%) participants were 60 or older. The sample included 44 (49.4%) male and 10 (11.2%) non-White participants. At enrollment, delirium was present in 21 (23.6%) participants. Older participants (60 and older) were significantly more likely to test positive for delirium on enrollment (odds ratio [OR]: 3.23, 95% confidence interval [CI] [1.15, 9.06]; p = 0.02). Four (4.5%) participants had delirium at enrollment only. There were random missing data from delirium measures during 21 videorecorded observation sessions. Two participants had delirium measures missing for all four sessions and six other participants had delirium measures missing from one to three sessions. 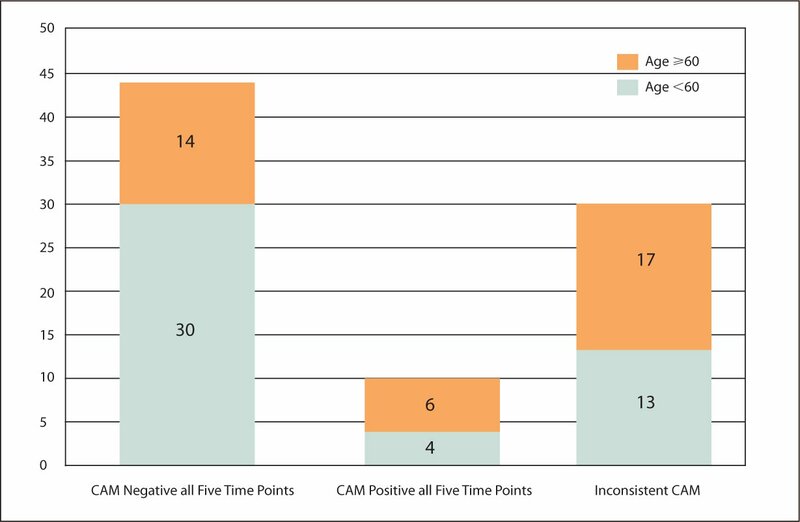 Some of these missing data were a result of participant refusal to complete the CAM-ICU; participant availability (i.e., rapid participant transport off the ICU); or participant physiological or psychological state (e.g., fatigue, decreased level of consciousness, acute changes in physiological state). These missing data were excluded from the analysis and construction of delirium trajectories. Approximately half of all participants (44, 49.4%) were not delirious at any time during this study. 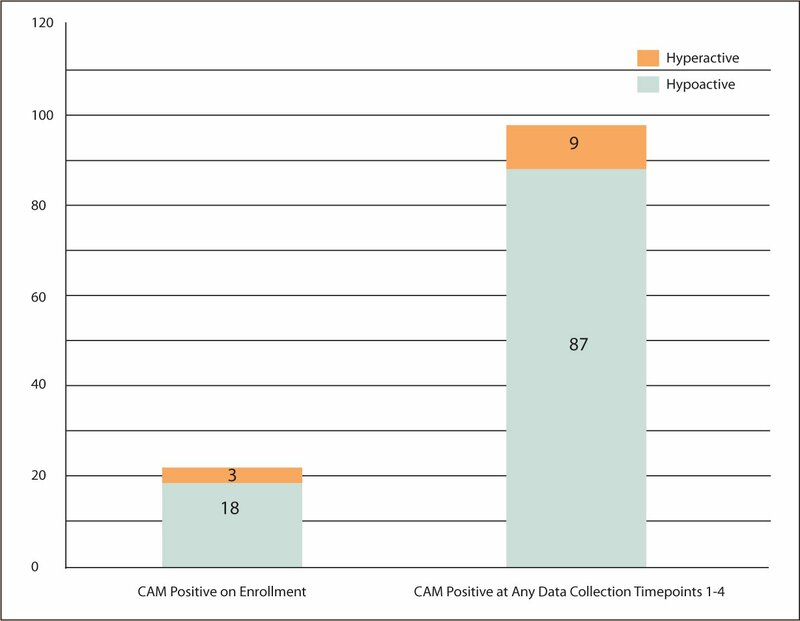 Of the 356 observation sessions, 38 (42.7%) participants tested CAM positive (delirious) during at least one session. Ten (11.2%) participants were delirious at all five data collection time points. 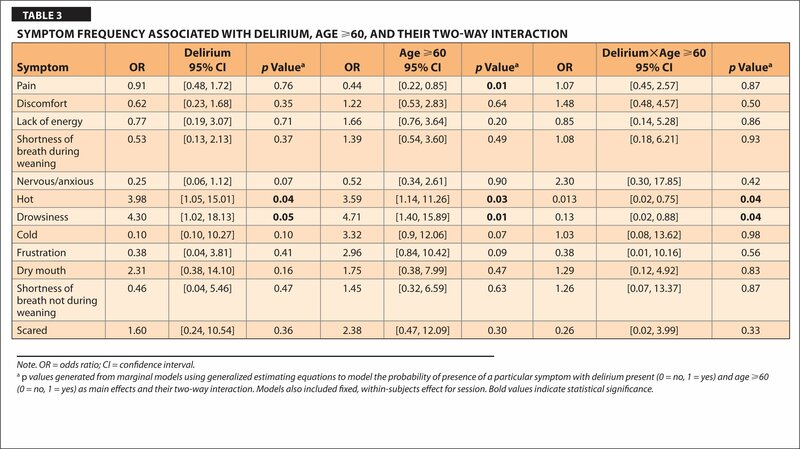 Older age was not significantly associated with delirium seen consistently over the five data collection time points (p = 0.07) (Figure 1). Figure 1. Delirium over five time points.Note. CAM = Confusion Assessment Method. Five participants had missing delirium data. Delirium was present in 96 (28.7%) videorecorded sessions. Of these sessions, older adults were represented with a significantly greater frequency (58/96 sessions) than those participants who were younger (OR: 2.62, 95% CI [1.19, 5.77]; p = 0.016). Hypoactive delirium was seen most frequently (87/96 sessions, 90.6%) in the entire group. When examined longitudinally, most participants who had delirium had the hypoactive subtype (n = 31/38 participants, 81.5%) and 7 participants had a mixed subtype of delirium, meaning that during some observation sessions, they were hypoactive (RASS < 0) and, during other sessions, they were hyperactive (RASS > 1). None of the participants had the hyperactive subtype across all observations of delirium (Figure 2). Figure 2. Delirium motoric subtypes at enrollment and during data collection over 2 days.Note. CAM = Confusion Assessment Method. When the enrollment delirium status was included, sessions were represented by older paticipants with greater frequency than younger participants (Figure 3). However, hypoactive subtype of delirium was experienced by both groups at a similar rate (younger participants, 89%; older participants, 90%). Figure 3. Delirium motoric subtypes (by age, 60 or >60) at enrollment and during data collection over 2 days. All 21 symptoms in our schema were reported at least once; however, several symptoms (e.g., difficulty sleeping, difficulty communicating, confusion, sadness) were reported by participants with very low frequency. 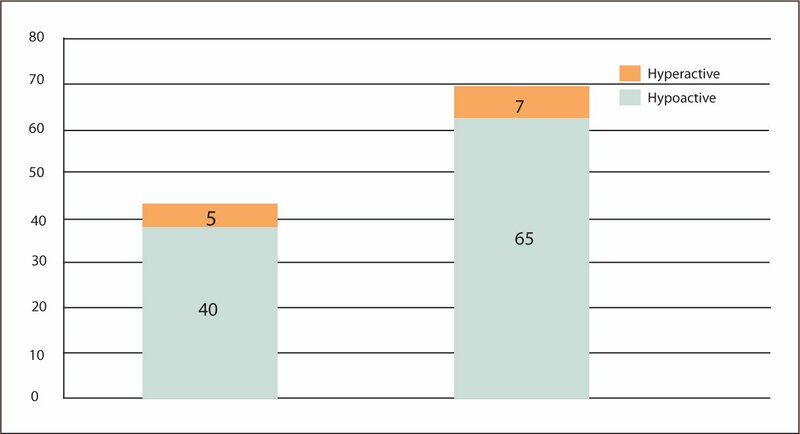 Symptom discussion by participants occurred in 260 (73%) of the 356 observation sessions. The range of different symptoms discussed was 1 to 7 per session. 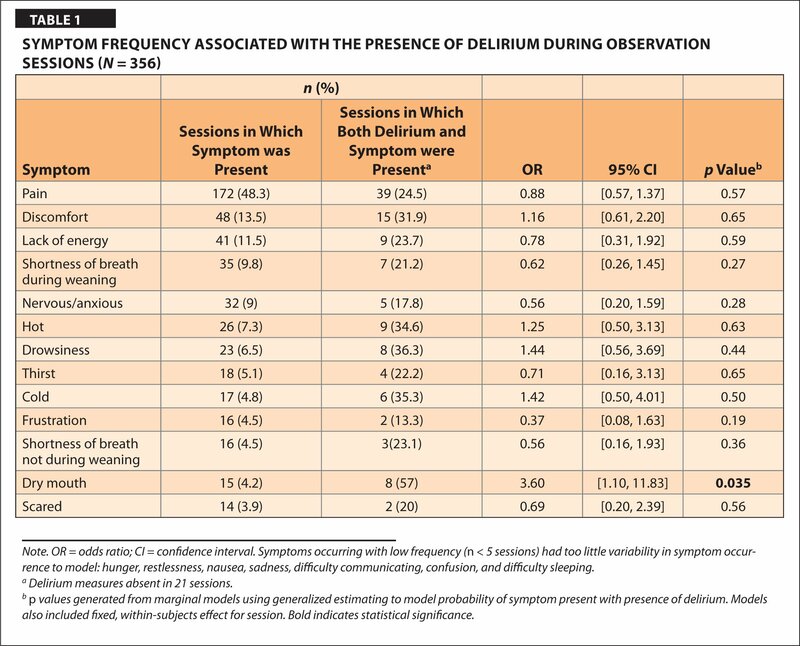 There were no differences overall in symptom communication occurrence whether delirium was present or absent (p = 0.38) or based on age group (p = 0.31). A significant difference was noted in participant reports of dry mouth (OR: 3.60; 95% CI [1.10, 11.83]; p = 0.035) when delirium was present (Table 1). All other symptoms reported by participants did not differ significantly when delirium was present. All reports of confusion (n = 3) were from participants who tested positive for delirium. Other symptoms (e.g., worry, nausea, difficulty communicating) were not reported at all by participants who were delirious. 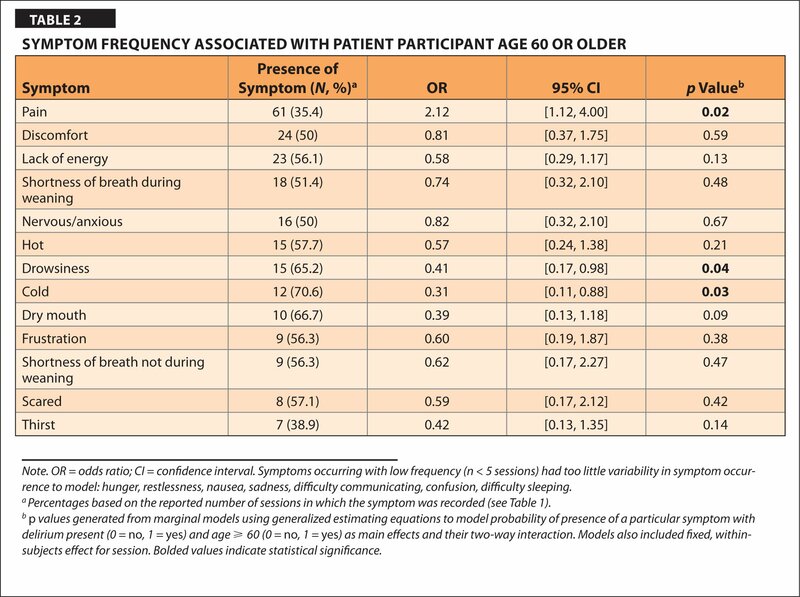 Frequencies of symptoms reported by participants 60 and older were significantly different from younger participants in the following symptoms: pain (OR: 2.12; 95% CI [1.12, 4.00]; p = 0.02); drowsiness (OR: 0.41; 95% CI [0.17, 0.98]; p = 0.04); and feeling cold (OR: 0.31; 95% CI [0.11, 0.88]; p = 0.03) (Table 2). When delirium was introduced into the model, age 60 and older was associated with participant report of pain (OR: 0.44; 95% CI [0.22, 0.85]; p = 0.01). The association between age and participant report of drowsiness remained significant when controlling for delirium (OR: 4.71; 95% CI [1.40, 15.89]; p = 0.01). Presence of delirium and older age were associated with self-reported drowsiness (OR: 0.13; 95% CI [0.02, 0.88]; p = 0.04) and feeling hot (OR: 0.013; 95% CI [0.02, 0.75]; p = 0.04), although this association was incrementally small (Table 3). Participants initiated discussions about symptoms in 110 (30.9%) sessions. Discussions about pain (n = 43) and discomfort (n = 13) were the most frequently initiated by participants. Participants who initiated discussions about symptoms were delirious in only 18 (16.4%) of the 110 sessions. Delirium significantly affected participant-initiated symptom discussion, with delirious participants less likely to initiate symptom communication (OR: 1.91; 95% CI [1.06, 3.43]; p = 0.03). There was no difference in participant-initiated symptom discussion between participants based on age (p = 0.73). This is the first study to explore the prevalence of delirium and delirium subtypes based on age. Our findings confirm previous research showing that delirium is a common occurrence during critical illness, with greater incidence and risk among patients older than 60 (Peterson et al., 2006; Pisani et al., 2007). Some participants (10/89, 11.2%) in this study were delirious at all time points over the course of 3 days, but the difference was not significant between groups based on age. Hypoactive delirium was seen more often than hyperactive delirium, a finding consistent with others (Pandharipande et al., 2007) and notable because of its contribution to under-recognition of delirium in the ICU. This study is also the first to examine the effects of delirium and age on symptom expression among nonvocal intubated patients in the ICU using direct observation. Our findings differ from Puntillo et al.’s (2010) checklist survey of ICU patients at high risk of dying, in which patients who tested positive for delirium were significantly more likely to endorse feeling confused (43% versus 22%, p = 0.004) and sad (46% versus 31%, p = 0.04) and less likely to endorse being tired (57% versus 77%, p = 0.006) than delirium-free patients. Puntillo et al. (2010) did not explore difference in symptom report based on age. The finding that participants who were delirious reported dry mouth more frequently might be explained by the theoretical relationship between cholinergic deficiency and development of delirium (Hshieh, Fong, Marcantonio, & Inouye, 2008). Similar to findings from Puntillo et al. (2010), all reports of feeling confused (n = 3) were reported by participants with delirium. Our sample differs from the Puntillo et al. (2010) study in that all participants in our study were intubated, whereas significantly fewer participants in their study were able to report symptoms if they were mechanically ventilated. Our methods also differed from the Puntillo et al. (2010) study by examining naturally occurring symptom communication between participants and their nurses rather than requesting participant response to a list of 10 common symptoms. Thirst and communication difficulty are symptoms shown in previous research with ICU patients as most common and most distressful (Nelson et al., 2001, 2004; Puntillo et al., 2010); however, these symptoms were not identified often by participants in our study. This is likely a reflection of the methodological differences. There might be conceptual overlap between feeling “tired” and feeling “drowsy.” Although we measured both thirst and dry mouth, Puntillo et al. (2010) only measured thirst. A potential overlap might also exist with these symptoms. Nurses drive and control communication with patients in the ICU (Finke, Light, & Kitko, 2008). Most of the symptom communication was nurse-initiated, with only 17% initiated by participants. Participants initiated symptom communication in approximately 30% of sessions with no differences seen based on age group. However, delirious participants were less likely to initiate symptom communication. Our findings are similar to those found in a study of communication capacity and delirium in terminally ill cancer patients (Morita, Tei, & Inoue, 2003). Using the Communication Capacity Scale and Memorial Delirium Assessment Scale, those patients who were delirious in their final week of life had more difficulty participating in complex conversations (Morita et al., 2003). Delirium imposes significant restrictions on communication with families and care providers and has a negative impact on symptom assessment and patient participation in decision making in terminally ill cancer patients. Decreased communication participation may be a marker of delirium, and improved communication might be a marker of resolving delirium in critical illness. It is unknown whether facilitation of communication during critical illness may have a protective effect on delirium. Limitations of this study include the use of videorecorded data to ascertain symptom discussions by participants. These discussions might have occurred outside the videorecorded sessions at other times during the day. Use of EMRs to identify patient-reported symptoms could also introduce bias, because symptoms recorded in the EMR by nurses are filtered by the nurse. Some symptoms may be omitted and those recorded by the nurse may or may not be a priority for patients. Furthermore, we enrolled participants at various times during their ICU admission with a median time to enrollment of 23 days. Delirium incidence and experience might be different after this length of stay. Finally, we examined the occurrence of symptoms as single entities. Additional work is needed to validate symptom clusters in critically ill patients and the impact of age and delirium on symptom clusters (Sousa, McDermott, & Weiss, 2011). We excluded participants with preexisting cognitive impairment. Given the high prevalence (89%) of hospitalized older adults with delirium superimposed on dementia, our sample might not be representative of hospitalized older adults (Fick, Agostini, & Inouye, 2002). Conversely, dementia increases the risk of developing delirium (Pisani et al., 2007). Older adults with dementia often arrive at the hospital without a definitive diagnosis or early in their dementia illness trajectory when cognitive impairment is underrecognized or dismissed by family members. Our sample might have included participants with dementia that was yet unrecognized. Delirium presents a difficult challenge for acute and critical care gerontological nursing practice. Patients with delirium have increased need for nursing attention and time (Pretto et al., 2009). Several studies have reported high levels of burden and distress for nurses when they care for patients with delirium outside the ICU (Breitbart, Gibson, & Tremblay, 2002; Mc Donnell & Timmins, 2012). Symptom identification should be carefully explored in older adults with or without delirium. Effective symptom management improves patient distress and can have a positive impact on health-related quality of life. The ability of critical care nurses to discern and manage symptoms in nonvocal critically ill patients is an integral part of nursing care quality and safe patient care (Finke et al., 2008). Conversely, misinterpretation or omission of symptom communication can lead to serious consequences or delayed treatment in this physiologically fragile population. Delirium assessment should be part of postacute care. Gerontological nurses responsible for post-ICU care should be aware of the potential that delirium associated with critical illness might be present well after the patient’s ICU stay (Cole, Ciampi, Belzile, & Zhong, 2009). The potential for delirium superimposed on dementia is an additional condition that warrants careful assessment and management (Fick et al., 2002). Hypoactive delirium is underrecognized by clinicians so assumptions that quiet patients are sleeping or simply well-behaved should be avoided. Multiple stakeholders, such as the American Association of Critical Care Nursing, National Quality Forum (National Quality Forum, 2004), and the National Institute of Nursing Research (Buerhaus, 2006), have given priority to research in symptom management. Although nurses embrace the strong relationship of symptom management to quality care, there have been few studies of symptom management in the ICU. Studies of symptom management have been devoted largely to pain and pain management in the critically ill patient. Furthermore, there are no studies to our knowledge of the symptom experience of critically ill older adults or studies that describe the impact of delirium on symptom expression on adults of any age. Evidence is needed to support consistent and efficient symptom identification and to identify and test appropriate and effective strategies to manage symptoms. Tate, J.A., Sereika, S., Divirgilio, D., Nilsen, M., Demerci, J., Campbell, G. & Happ, M.B. (2013). Symptom Communication During Critical Illness: The Impact of Age, Delirium, and Delirium Presentation. Journal of Gerontological Nursing, 39(8), 28–38. Delirium can have a negative impact on symptom communication in hospitalized older adults. Older age (>60) was associated with self-report of pain, drowsiness, and feeling cold. Patients were significantly less likely to initiate symptom communication when delirious. Symptom assessment should be undertaken with additional care in older adults because of the increased risk of presence of delirium.